Jamaicans like a little heat and a lot of flavor. So do I. Surprisingly I’ve never actually been to Jamaica but I’ve always been a fan of their cuisine…I’m sure I’ll go one day. Jamaican food is colorful and spicy with the warmth of cinnamon and allspice and the eye-watering effect of the scotch bonnet peppers. Did you know scotch bonnet peppers are one of the hottest chile peppers in the world? Make sure you have plenty of rum punch on hand (or wine) to wash it all down. This post would be incomplete if I didn’t tell you about the wine that I paired with this dish. This past weekend I was actually celebrating a promotion at work (woo-hoo! ), so I felt the urge to reward myself. I typically would never buy myself a bottle of wine over $12, but what the heck… now I’m a not-so-poor little rich cook. Whenever I make spicy food I always go for wine that will help balance the intense flavors and extinguish the burn. I’ve never been a huge fan of Riesling because I always have found it too overpowering and full of residual sugar. This all changed though when I discovered white wine from the Alsace region of France. Along with Austria and Germany, vineyards from this region produce some of most acclaimed dry Rieslings in the world. 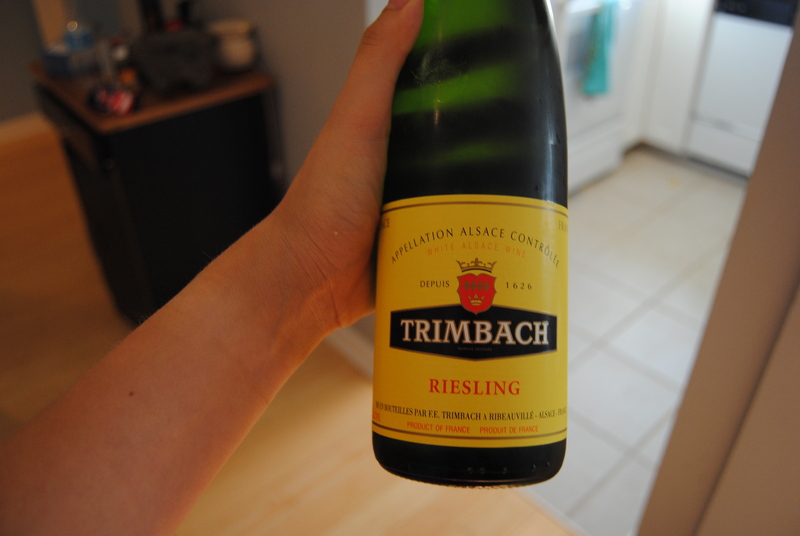 I tried a new bottle called Trimbach and it was amazing. It set me back about $23 and was worth every penny. Though not traditional Jamaican fare, this recipe does include jerk seasoning which is unmistakably Jamaican. For this recipe I used a local brand called Dizzy Pig BBQ Jamaican Firewalk seasoning. 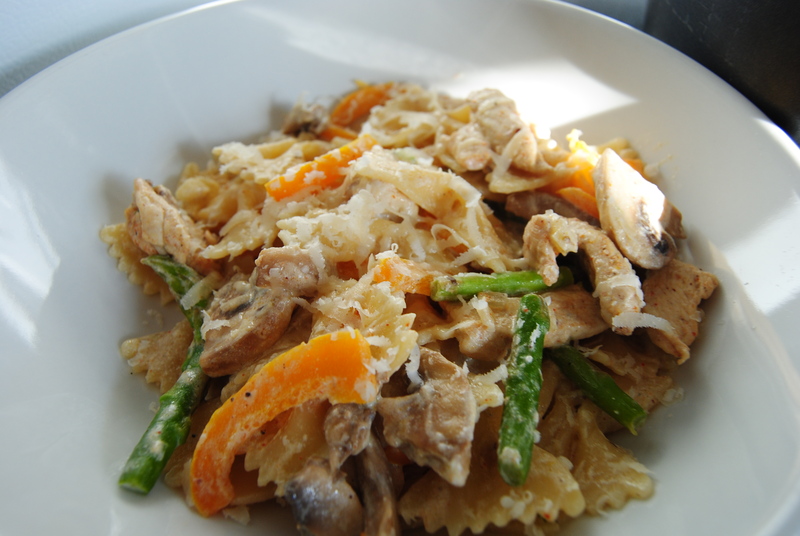 I wanted to make something rich and familiar, so jerk chicken pasta was the first thing that came to mind. I first got my inspiration for this dish at a chain restaurant called Bahama Breeze. I haven’t been there for years, but when I went I would almost always order the jerk chicken pasta. Their version is quite fattening…tons of heavy cream, parmesan cheese, and a serving big enough for a family of five. Mine isn’t exactly fat-free, but I did make some modifications to make it a bit lighter– olive oil instead of butter, half & half instead of cream, less bowtie pasta, etc. Enjoy my take on jerk chicken pasta, mon! Bring pot of water to boil and add bowtie pasta. In medium sauce pan, add 1 tbs olive oil and sauté the bell pepper, onion, garlic and asparagus. Cook 5 minutes. Add chicken (seasoned with 1 tbs jerk seasoning) and cook until no longer pink, about 8 minutes. Add mushrooms and cook until they start to release liquid. Add in sour cream, half & half, salt, pepper, and remaining jerk seasoning. Let simmer about 5 minutes until sauce begins to thicken. Add in cooked bowtie and let simmer another 5 minutes. Serve immediately with freshly grated parmesan.